Miss R's Rule Number 3--Do something to make the world more beautiful. A couple of years ago a client told me she wanted to drive into her driveway to a beautiful garden and asked me to design one for her. Easy enough request. She also wanted to screen off the back yard with some trelliage but didn't want climbers on it. Easy enough request. She wanted a deer resistant cottage style garden in her favorite color combination--blue and yellow. Again, easy enough request. When the trellis work was installed, there was only one logical place for it so that's where it went. What was left for this garden of easy enough requests was a 30" wide bed between the fence and the blacktop in the blazing sun where the plow would push the snow in the winter months. Not so easy any more. 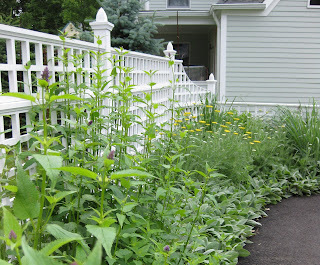 These types of garden problems are what landscape designers excel at and when it really makes sense to consult with a professional. Now three years later, the garden is thriving without irrigation or much care and it looks great. What's the secret? Plant choice. 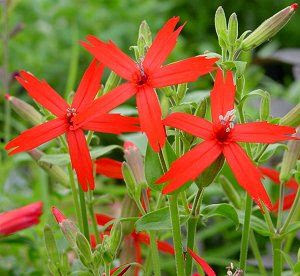 All of the plants chosen for this garden are drought tolerant, heat and sun loving, and tough as nails. This is my first bloom day. With a cool June and two weeks of mostly gray and rain...here's what was blooming this morning. In order top to bottom: Thermopsis caroliniana, Clematis sp. (a rescue, not sure of cultivar), Hydrangea arborescens 'Annabelle', and one of many Lychnis coronaria. My professional need to know plants is how I ended up with The Garden of Lost Plants. My personal gardens looked more designed when I was an amateur. I am not a plantaholic, although to look at my home garden, you would think I was. My planting design knowledge of plant needs, form, structure and maintenance comes from personal experience. As a landscape designer, I learned early on that specifying plants for a specific site without having firsthand knowledge of them can lead to garden disaster in a season or two. 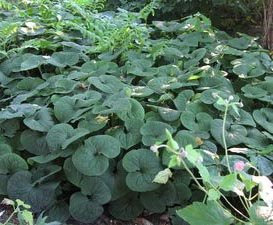 I just can't design a great garden from pictures and descriptions in a book or a catalog...I have to know the plant. Obviously I can't grow everything so that's where garden visits come in. I have one of many plants--with few multiples--I watch each grow, observe how big it really gets, what texture the foliage creates, if the bloom color and time is what I expect, and if the way I neglect them allows them to survive. I am always experimenting and have found winners and losers through this hodgepodge, totally unscientific process. My garden is not fenced or sprayed--I barely have time to pull the weeds. It is in a sub-urban environment with deer, rabbits, chipmunks, moles and a dog who has no respect for my efforts. Add kids and this is a similar environment to many of the landscape design projects I work on. I try to make The Garden of Lost Plants look as if they've seen a designer's hand, but it's a challenge with one of each. I group plants together using basic design principles--contrast of foliage texture and color, diagonal repetition of color, shape and structure that helps to create a visual pull through the space. I make sure plants are peaking out from around corners to beg further inspection. Those that I suspect will be showstoppers get the 'look at me I'm a star' placement. I rotate plants in and out of empty spaces that are still in containers until they go to a new home and I've been known to dig something up and take it to a client--leaving a hole until a new orphan or test case takes its place. Some plants are so successful that I have too many--bearded Iris for one, Leucanthemum superbum 'Becky' is another. A couple of years ago I added some woodies for trial and structure. That has helped with design cohesion a bit. Plants move in and out of my garden constantly. It is pretty and somewhat over the top and yes, there are things that stay for years. Sometimes they even survive the lawn guy's string trimmer. The old man disappeared a few months back. His ancient Lincoln Continental, with its glossy finish gone flat and peeling from years in the sun, was always parked in the driveway. Every day, as I passed by on my early morning walk, I picked up his newspaper and put it on the trunk of the car so he wouldn't have to bend down so far. The old man's yard was unique to him. Two beautiful cherry trees heralded each spring's return, their lowest branches adorned with hanging baskets full of faded plastic blossoms. A garden of pinwheels stood at the foot of one. He had a sense of whimsy. The old man disappeared a few months back. The Lincoln is gone--a neighbor parks his car in the empty driveway now. The garden is overgrown, but the pinwheels, hidden in the knee high grass, remind me that the old man had once been there and I smile. I have spent my adult life as a designer in several incarnations. I currently practice residential landscape design in New Jersey. Miss Rumphius' Rules has been my screen name since 2001. The blog was conceived in 2007 as online journal exploring my continuing journey as a designer with a focus on design, gardens, and my creative process. I hope people find it inspiring, though provoking and interesting.